Playing the Identity Card in Southeast Asia? Home > Playing the Identity Card in Southeast Asia? Political contests in Southeast Asia as in the rest of the words have often been influenced by identity claims and featured arguments around ethnicity, race or religion. Analysts and observers, however, have noted that in recent year identity politics have played a more significant role in maintaining political power and even more in the race for political office. Elections, when held, have exposed identity cleavages within plural societies and a tendency to articulate discourses around “indigenousness”, “moral purity” or “homogeneity” at the cost of a constructed “other”. Zainah Anwar is a prominent Malaysian non-governmental organization leader, activist and Muslim feminist. She was the head of Sisters in Islam for more than two decades before stepping down and now heads Musawah, a global movement for equality and justice in the Muslim family. She also writes a monthly column on politics, religion and women’s rights, called Sharing the Nation, in the Sunday Star, Malaysia. She is a former member of the Human Rights Commission of Malaysia. 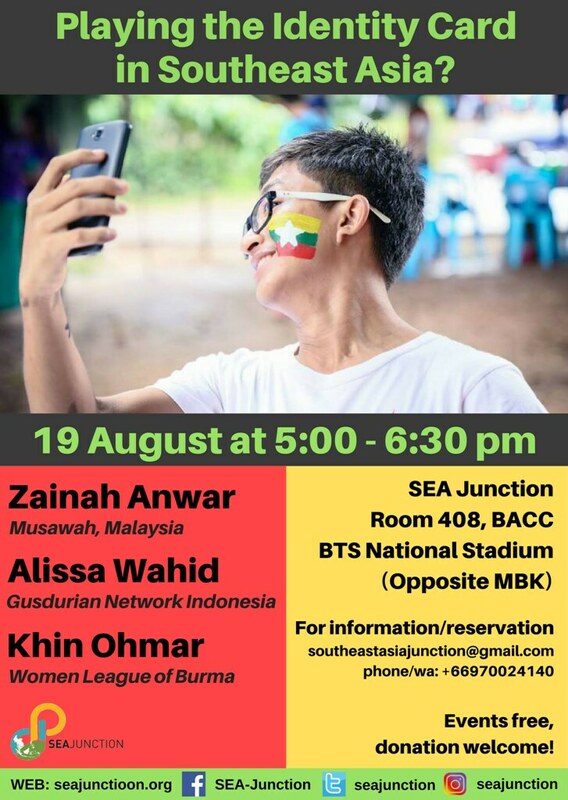 Khin Ohmar is an influential and award-winning democracy activist from Myanmar, who has been working on the front lines of women’s empowerment and political reform since the 1988 student protests. Forced into exile by the government, and repeatedly denied a visa to return home, she has continued to care about her country through Burma Partnership, a network of organizations throughout the Asia-Pacific region supporting the collective efforts of all peoples working towards democracy, peace, and human rights in Burma and now Progressive Voices. She also founded and is a prominent representative of the Women League of Burma. Events are free, but donation most welcome!